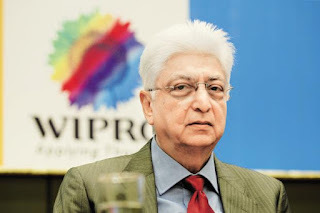 Azim Premji, Chairman of Wipro Ltd, will be felicitated with the Ernst & Young Lifetime Achievement Award. Ernst & Young, famously known as EY is a multinational professional services firm and is one of the "Big Four" accounting firms. Azim Premji was born on July 24, 1945, to an affluent Gujarati entrepreneur. He inherited Wipro, a vegetable oil company at the age of 21 after the sudden demise of his father. Azim Premji was pursuing Electrical Engineering from Stanford University, USA when he took over the reins of his family business in 1966. He led Wipro from a hydrogenated cooking fats company to a pioneer in providing integrated business, technology and process solutions on a global delivery platform. Wipro Technologies is the largest independent R&D service provider in the world and is ranked among the top 100 technology companies globally. In 2005 Premji was conferred the Padma Bhushan and Padma Vibhushan in 2011. Premji has also pledged to donate USD 2 billion for improving school education in India, the first of its kind by any Indian billionaire. Q.Which Indian business leader will be felicitated with the Ernst & Young Lifetime Achievement Award?